Summary: A very useful shareholder event that accompanied a better-than-expected trading update. The bright spot was recovering UK revenue, although management oddly could not explain why the rebound occurred. Another special dividend and the purchase of an Australian distributor were welcome developments, too. Plenty of interesting snippets were disclosed during the day, including certain products having their prices doubled. However, I still disagree with management about past disclosures. I continue to hold. 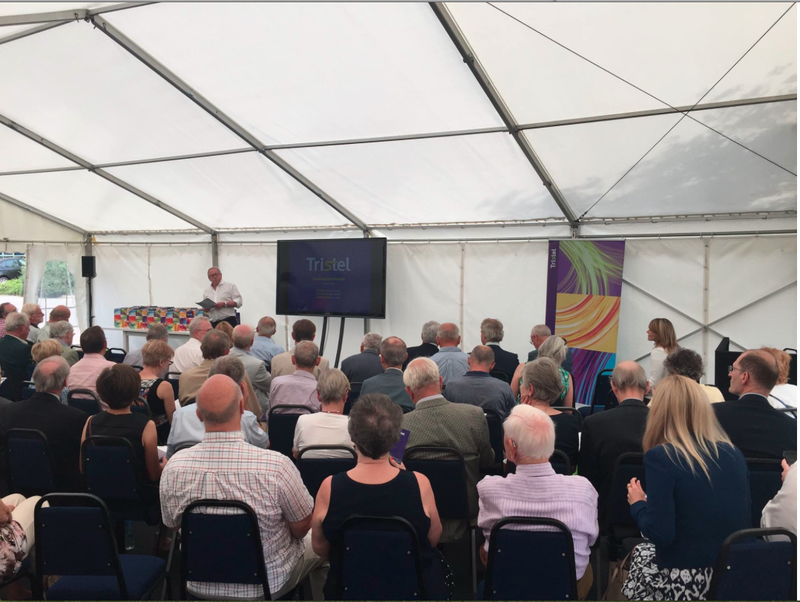 Last week I travelled to an obscure village just off the A14 in Cambridgeshire to attend TSTL’s shareholder open day at the group’s head office. Greeting me were several ushers car-park marshals, who wore fetching pink high-viz waistcoats, while just outside the office stood a large white marquee where the service presentation would take place. TSTL managers wandered around in smart dress complete with white carnations, leaving me to mingle with the mainly elderly guests with pre-event refreshments and discussions about the happy couple executive duo. “The Company enjoyed very strong second half growth in both the UK and overseas compared to last year. UK revenues in the second half were £5.3 million, an increase of 10.4% on last year’s £4.8 million. The UK performance was the most surprising for two reasons. First, the 10% advance in the second half compared to a 2% advance in the first. If you recall, TSTL’s managers appeared quite gloomy in February’s interim results webinar. Comments back then included “[the NHS] is now, without doubt, in financial distress” and “the speed we can capture new business will slow”. After those comments, I was not expecting such a significant UK improvement within this statement. The second surprise? I asked in the marquee why UK revenue had improved… and TSTL’s directors didn’t really know why. There was some talk later of NHS ordering patterns being somewhat variable, with the highest weekly orders being three times as much as the lowest. Available warehouse space and missed patient appointments were suggested as reasons for the weekly ups and downs. But why exactly UK revenue had increased so much in the second half — especially after the executives had previously said the NHS had become “very, very difficult” to sell into — remains a mystery to the board (and me). You may recall TSTL had been reviewing certain low-margin legacy products because of the incoming Biocidal Product Regulation (BPR) rules. February’s results webinar revealed that revenue of £200k was lost in the first half after two products were culled, and cited a further £700k-800k could be lost for the full year were other old products to disappear as well. …and that customers were continuing to buy them. It wasn’t made clear just how much of the £1.1m second-half sales advance was due to BPR products doubling in price, but I guess the price hike must have had some impact. I presume the BPR-related price rise will positively affect the current half (the six months to December 2016), too. “Tristel has continued to generate significant levels of cash and at 30 June 2016 cash balances were £5.7 million compared to £4.0 million at 30 June 2015. The Company has no debt. Accordingly the Board has decided to return to shareholders the portion of this cash that it considers surplus to its investment and operational requirements and announces a special dividend of three pence per share payable on 5 August 2016 to shareholders on the register on 29 July 2016. What’s also encouraging is that cash during the year advanced by £1.7m… despite £2.5m being distributed as dividends. True, TSTL’s bank balance was helped by at least £0.5m received following the exercise of options. Even so, underlying operations helping the cash position advance by at least £3m very much underpins TSTL’s projection of a £3.1m-plus pre-tax profit for the year. Following February’s interim results I outlined my doubts about the leadership of this business. …but February’s interim results then owned up to 8% revenue growth and confirmed the group’s 2017 sales target of £20m would now be “unlikely to be met”. Rubbing salt in the wound was a £1m options windfall, which the executives and senior managers collected in January — one month before TSTL reported the lower rate of sales growth. I won’t recount the whole palaver (you can read it all here) but the upshot is that — in my opinion — the £1m options windfall would not have been available to collect in January had the slowing revenue figure been disclosed at December’s AGM. Anyway, I put all this to TSTL’s executives… who in turn “strongly rebut” the allegations of a lack of disclosure and of management “dipping their fingers into the till”. The executives explained that the business was focused on profit, that profit was at least in line with expectations for 2016 and 2017, and that past trading statements had always mentioned profit but not always revenue. “We expect unaudited pre-tax profit for the first half to be no less than £1.4 million, compared to a pre-tax profit of £1.1 million for the same period last year – an increase of at least 27%. The full year profit for the year ended 30 June 2015 was £2.6 million. The Board believes that performance continues to be in line with market expectations. Of all those trading statements, only the one issued during April 2014 (aside from the December 2015 update in question) did not declare anything about revenue whatsoever. The rest either mentioned a specific revenue figure or at least gave a positive reference to revenue progress. You can draw your own conclusions as to whether a revenue figure (or revenue comment) should have been expected within December’s AGM update. I know what I think. Now moving onto the £1m options windfall. TSTL’s management argues that the RNS still “reads clear”, that the 30-day/134p share-price condition was originally expected to be met after two or three years, and that the group’s relatively low-paid senior managers were also included in the grant. Fair enough, the share price rallied sooner than expected and other managers were granted these options, too. However, I still maintain the RNS did not make it clear that all the options would vest immediately if the 30-day/134p share-price condition was met. It means us shareholders can expect the dilution of those options on the share-count and earnings per share much sooner than the original RNS suggested. Anyway… having looked through this whole sorry saga again, I continue to feel TSTL’s disclosure within the AGM statement and the options grant announcement was poor. And the real shame of all this is that, following last week’s trading update, the share price has since rallied to 130p… meaning it is not out of the question that the shares could soon exceed 134p for another 30 days. As such, it’s now looking possible that TSTL’s managers could still have received their £1m options windfall in good time — but without the brickbats — if the lower revenue figure was disclosed within the AGM statement. The open day provided some useful snippets on patents. A persistent questioner in the marquee had his various queries over TSTL’s chlorine dioxide formula batted away, with the group confirming its 150 worldwide patents cover the way the chemicals are mixed and applied through foam, wipes and sprays, rather than cover the chemistry formulation itself. Management made the point that even if the patents were circumvented through a different approach, an alternative disinfectant would still have to offer at least the same clinical results that occur within at least the same process time for the hospitals to become interested. Furthermore, the alternative would then have to compete with TSTL on price. …and the board claimed the longer that similar competition remained absent, the deeper the roots the company could grow into the sector. Having products specified in medical guidelines such as these was also cited as a competitive advantage. A good question about the NHS potentially demanding price reductions elicited an encouraging response in the marquee. Due to various agreements in place, TSTL is apparently “not under any pressure to reduce prices” although the business is mindful that the NHS does have its financial issues. I gather the cost of the main wipes product to UK hospitals is about £4 a pop. I asked about the threat of hospitals downgrading from the wipes system to the much cheaper foam product. I was told such a shift is a risk, but the foam product does not have an audit process and is suitable only for certain, smaller instruments. Larger instruments require the wipes for a proper disinfection. I did not pick up anything too earth-shattering about developments to launch a product in the United States. A submission to the US regulator is expected to be made by the end of the year (once expected by June this year) and some sort of approval is still expected by June next year. TSTL plans to launch its cheaper foam product in the States, the market for which could be £5m for disinfecting ophthalmology equipment alone. The market for disinfecting ultrasound devices in the States could be “much larger”. Gaining US approval may also underpin the product’s qualities with new overseas distributors and regulators. I sensed at the time these remarks may have been too optimistic and, after seeing the product for myself at the open day, I can confirm the licensing speculation (or in fact any massive revenue speculation about the device) is complete cobblers. The product in question is now called Puffin, and we saw a 3D-printed mockup of it at the event. Anyway, the way Puffin works is by the screw top containing the disinfectant chemicals, which then mix with water in the device when the top is fastened on. (I was told the product would be seen as an appliance, so it would be kept on your kitchen tops like a kettle rather than being stuffed in a cupboard with your typical floor cleaner. The obvious downside of the product (at least to me) is that its disinfectant currently has a shelf life of only one or two weeks. There are plans to extend that lifespan, but I can imagine Puffin buyers may have to pour some of their disinfectant away. Puffin’s revenue plan seems ambitious. Taking a leaf out of Dollar Shave Club’s book perhaps, the aim is to build a subscription model for a continuous supply of disinfectant capsules with promotion via ‘viral’ marketing. All told, I will be amazed if Puffin generates any significant income. And I see Equity Development has, since December, never again speculated about handsome licence fees from this product. “Tristel has acquired the assets and business of Ashmed Pty Ltd, Melbourne. 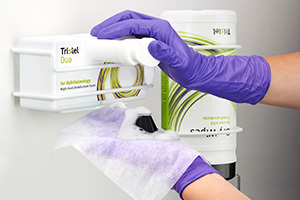 Since 2011 Ashmed has acted as the Company’s distributor in Australia for the Tristel Wipes System. The consideration is AU$1.35 million plus certain compensation payments for the re-purchase of inventory. The management team is staying with the business. The deal looks quite sensible to me. I understand the distributor’s revenue is derived mostly from TSTL’s wipes, so there is scope perhaps to sell other group products into the Australian market. TSTL now reckons its pre-tax profit before share-based payments will be at least £3.1m for the year to 30 June 2016. Based on previous management comments, I am subtracting £100k for ongoing share-based payments and adding back £120k for one-off-costs relating to the USA project. I am also adding £200k for the underlying contribution from the wholly owned Australian subsidiary. All that gives me a £3.3m pre-tax profit and earnings of perhaps £2.6m, or 6.3p per share, after applying a 20% tax charge. Net cash of £5.7m less the £775k spent on the Australian division gives around £4.9m or almost 12p per share. That leaves my estimate of TSTL’s enterprise value to be £49m or 118p per share. Dividing that 118p by my 6.3p per share earnings guess gives a multiple of 19. Clearly the market expects TSTL to continue to expand and the execs told me they could not see anything that would cause the business to revert to low or no growth during the next few years. For what it is worth, the board reckons UK revenue may grow at 5% per annum and overseas revenue at 20%. I can only hope there’s consistent disclosure of such sales from here on in. Superb precis. Thank you. How on earth is it worth you posting this stuff for free? I increased at 90p on the dip. I am not convinced about valuations because of the uncertainties and I am not convinced about the management so your acute, and entertainingly penned, observations are a good touchstone. I am however convinced that this is a worthwhile technology that will find its niche. In the meantime it is great fun. Thanks for the Comment. I’d like too think posting this stuff will help my own investing decisions — sadly the jury is out on that one at present! Sadly I could not make the meeting but I really enjoyed reading this post. Clear, insightful and analytical with a bit of humour thrown in. Excellent. I have to admit to still feeling a little disenchanted over the nil-cost options fiasco but I have to give management credit for continuing to actively engage with private investors and in regaining some of the lost sales momentum. The strange aspect of the options fiasco is that it provided a good opportunity to increase, iff one was convinced that it was a one-off. Thanks for the Comment. Yes, credit should go to management for hosting these events, and the webinars, other meetings, etc. The disclosure issue has been a shame, but the product attractions remain. Another excellent write-up; thanks Maynard. Was there any indication how much the Puffin project is likely to cost? Is it targeted at households or have they identified a market where a regular supply of perishable disinfectant is an advantage? I assume it must be households if they’re thinking of viral marketing. People may question the cost-effectiveness and environmental impact of regularly pouring unused disinfectant down the drain. Quite a headwind to overcome in a viral marketing campaign. Tristel could presumably sell more of their existing products into the healthcare systems of every developed country in the world without changing anything. Why commit capital and management time to step outside their circle of competence with something like Puffin? Sorry, I realised afterwards that I did not ask about cost — either for the entire project or the amount the consumer would pay. I was a bit dumbstruck by the thought of a subscription model, viral marketing and the lifespan of the disinfectant to consider costs. Yes, the product is aimed at households, and the handouts mentioned competition such as Dettol, Cif, Flash and normal bleach. Whether the disinfectant in reality is poured away remains to be seen — I just assumed it would be given what I was told on the day, but the TSTL rep did say the group was working on extending the current shelf life. I suspect the project cost to date has not been that great, that the capital and management time commitment is not huge either, and that all of it could be chopped quickly if the project gees wayward. 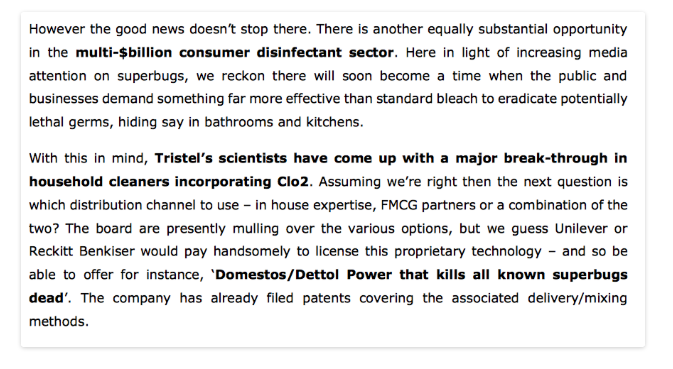 I just wonder if TSTL has looked at Dollar Shave Club or similar and thought it could do the same to Reckkitt/Dettol as DSC is doing to Gillette (perhaps). A quick check on Tesco shows 500ml of Dettol surface cleaner anti-bactieral costs £1 (it’s on sale, normally it’s £1.50). One Puffin capsule uses 300ml of water, so the capsules will perhaps have to be sold at well below £1 to gain any major volume traction. And even then the savings in total will be relatively small — how many surface cleaners, bottles of bleach, etc, do you buy a year? Can’t be too many for most people. And how many people will actually care if the Puffin kills more germs when the existing cleaners do an okay job now and people at present generally don’t end up ill from kitchen surfaces etc. I am in big (for me) with TSL and your insights are very welcome. Think Puffin may be noise – but the US licensing could be very significant.